Construction work of what is billed to be East African Coast’s largest military shipyard has started in Mombasa. 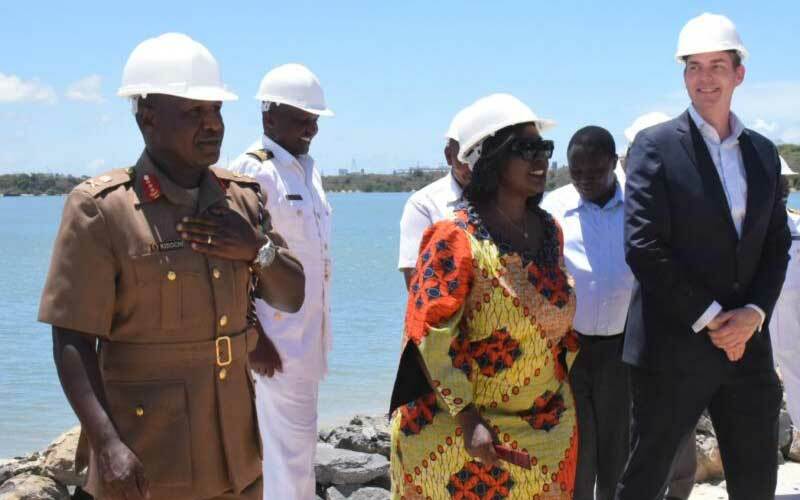 Defence Cabinet Secretary Raychelle Omamo termed the project a game-changer for the maritime industry, saying it was timely as it is being implemented at a time the government is keen on harnessing the blue economy potential. “I have full confidence in what Damen (contractor) will undertake and I hope they will keep to the timelines to have the project ready by 2021,” the CS said during the launch at the Kenya Navy Base Mtongwe Dockyard-Mkunguni. Kenya Navy Commander Major General Levy Mghalu said the first Kenya Navy dockyard was built in 1988, and was meant to repair smaller vessels. Vice Chief of Defence Forces Lt General Robert Kibochi, who represented Chief of Defence Forces General Samson Mwathethe, was optimistic that the shipyard would save the government money for ship repairs that are currently done in private dockyards or overseas. Damen Director for Africa Ronald Maat said apart from carrying out vessel repairs, the facility will also have capacity to build new vessels on order.